Analysis in brief: Due to increased economic growth and development, largely as a result of improved political stability, African exchanges offer great investment value for both African and foreign investors. Although there are still some difficulties to overcome to make African Exchanges more attractive to international investors, with the political will and dedicated efforts by governments and exchanges, these difficulties can be overcome. Few people are aware of the business, economic and IT successes being achieved in Africa. Mauritius is poised to become Africa’s first high-income economy within the next 10 years and there are a number of other African countries that are working actively to achieve the same. The former-President of Botswana, Ian Khama, has famously remarked that Africa has the ability to solve its own problems and he was right. Africa currently has 27 national security exchanges, as well as three regional exchanges, with the Johannesburg Securities Exchange (JSE) being the largest in terms of market capitalisation. Although 2017 was a good year for US markets, many African exchanges offered investors better returns in dollar terms. 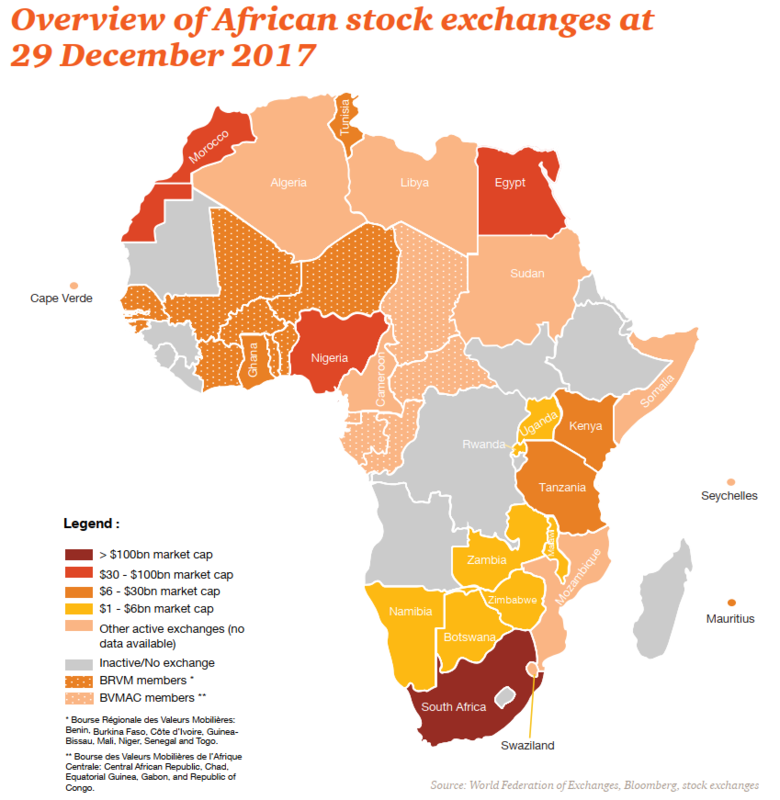 The growth in value of a large number of African indexes proved worthy of attention: Malawi rose by 56%; Ghana grew 43.58%; Uganda rose by 30.7%; Mauritius increased 29.9% and the JSE rose by 29.7%. All of these African exchanges outperformed the NASDAQ, which grew by only 28.2%. Yet, sadly, unless you are physically residing in an African country, you, as a private investor, are generally prohibited from investing in its exchange. The majority of African exchanges require that private investors be either citizens or at least residents in the country and, furthermore, the services of a traditional brokerage is required, as many of the exchanges have not yet been digitised. There is great interest both within Africa and abroad to invest in African exchanges, but much of current national legislation makes it impossible to do so, thereby stifling continental investment. Earlier in the year, 44 African states entered into the Africa Continental Free Trade Area and Peace and Security Agreement, yet there is no comparable agreement to make Africa a free investment zone. Such an agreement would go a long way towards encouraging intra-African investment but would also have to be carefully modulated to prevent illicit capital flows, which costs the continent billions annually. In doing so, restrictive laws and regulations may be judiciously replaced while allowing for increased liberty in trade and investment. In this regard, it is important to note that there are already a number of exchanges, such as the JSE, Egyptian Exchange and Namibian Stock Exchange, that allow for cross-border investment by private investors, but this must be significantly expanded to unlock further potential for future growth and development. Once the necessary legislation has been set in place, intra-African and foreign investment will take off drastically. Image courtesy of 2017 Africa Capital Market Watch, PWC, March 2018. Aside from legislative difficulties, another major impediment to investing in African exchanges is that the majority of African exchanges have not yet digitised or are still in the process of being digitised. In the super-fast paced world of the 21st century, African exchanges need to digitise as a matter of national priority, lest they be left behind. Within the digitised investment world, billions of transactions take place every second and a traditional stock market cannot deal with such quantities or at such speeds. This presents a phenomenal opportunity for IT and financial services companies, as the required skills and experience are not necessarily readily available within these countries. By creating a digital trading platform allowing all Africans to trade in all African exchanges, local, regional and continental economies would be able to grow and develop exponentially, creating more disposable income, growing the Upper and Middle classes, creating more jobs and creating more public wealth, thus facilitating social upliftment. This would serve to strengthen and grow the economies of the countries concerned, as it would help with the diversification of their economies whilst strengthening them against commodity and economic shocks and downturns. Image Courtesy: 2017 Africa Capital Market Watch. PWC. March 2018. Another large obstacle to investing in African exchanges is a lack of liquidity. The lack of liquidity can largely be ascribed to poor pricing of markets, lack of digitisation, high trading fees, and a lack of choice in investments due to the relatively small number of companies listed. Governments and exchanges need to actively engage the corporate sector to encourage investment in African Exchanges. Especially in view of the high performance rates by African indexes, corporations can achieve greater capital growth on African Exchanges than abroad. By making use of tax incentives, governments can ensure that corporations rather invest locally. There is also a lack of knowledge amongst the general population regarding exchanges and the wonderful opportunities they present for income generation and return on investment. If we would ever like to close the income inequality gap in Africa, we need to encourage Africans to become active participants and investors in our own economies. One of the only ways in which to alleviate the great income inequalities in Africa would be by educating, encouraging and assisting locals to invest in their economies, as this will assist them in generating more income. This will also create more disposable income and grow the economy, thus contributing to the reduction of income inequality and creating more inclusive economies on the continent. It is the responsibility of the governments and exchanges of each country, as well as of the financial industry and listed companies, to educate their populations on how to invest in their exchanges as well as the potential for income generation and return on investment. It needs to be ensured that not only are people educated in investing but that they are educated in how to become successful investors, otherwise the endeavour will be doomed to failure. Great strides have been made in recent years to increase participation in exchanges, especially by the stock exchanges of Namibia, Rwanda and Dar es Salaam, as well as the BRVM. The JSE, Egyptian and Moroccan exchanges are also actively engaged with a number of partners in educating the population of their countries on the benefits and techniques of active investments in the stock exchange, thus expanding the total number of private investors. The Upper- and Middle-income classes in Africa have a lot of disposable income that could be better used to invest in African exchanges. By focussing on investment by private citizens, African states would be able to quadruple investment by their own citizens in their exchanges, thus successfully making equity in their countries more liquid and subsequently more desirable, resulting in yet more liquidity. Furthermore, if the necessary legislation is adopted to make it easier for non-residents to invest in their exchanges, there will be an influx of foreign investors, further increasing liquidity in African exchanges. Between 2013 and 2017 more than 130 IPOs have been registered in African Exchanges, raising over US$ 9.1 billion. This represents a 37% increase over the preceding 5-year period. The majority of these were in the JSE, followed by Egypt and the BRVM. 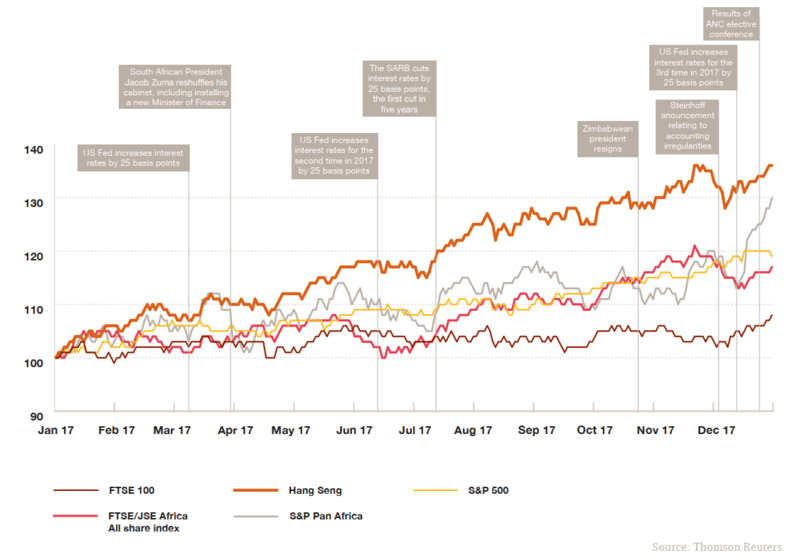 The market sentiment is clear that the JSE continues to be a good investment destination, faith is being restored in the stabilised Egyptian market and Francophone Africa’s economies are growing. 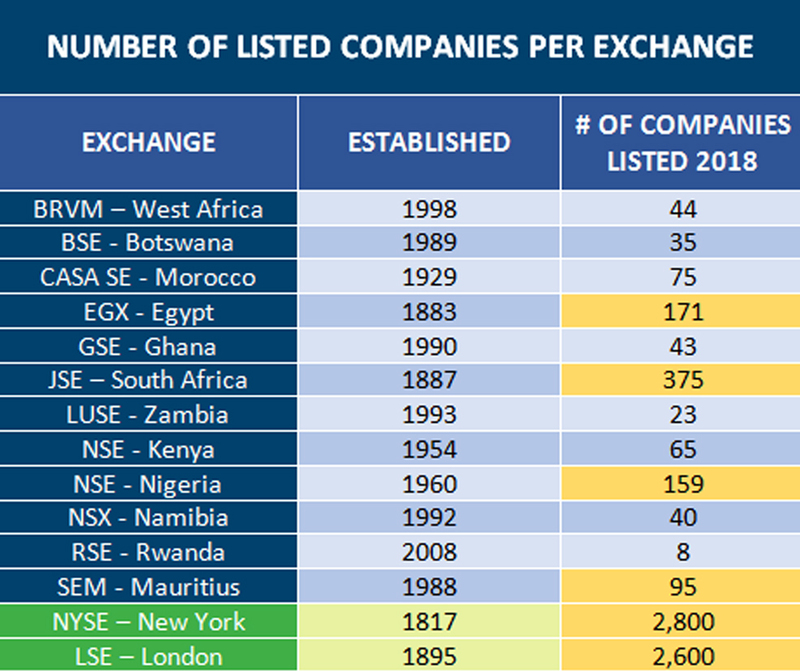 In spite of this, African exchanges do not generally offer as wide a variety of listed companies as most other exchanges. Although a large number of major companies in Africa are family-owned, there are still benefits for them in listing a portion of their company, as this will enable them to get cheaper access to funding, thus enabling them to expand their businesses, without loss of business control. It is the responsibility of the government and exchange to engage the large and growing businesses in their country and to educate them on the benefits of listing on the exchange. In this regard, a number of African exchanges are actively promoting listing. West Africa’s BRVM has introduced a junior board aimed at boosting SME financing and has also joined the London Stock Exchange’s (LSE’s) ELITE programme, which specifically targets SMEs for development and capital raising support. Casablanca already joined ELITE in 2016 and has since then introduced 48 companies into the programme. The JSE introduced four new exchanges in 2017, namely, ZARX, 4AX, A2X and the Equity Express Securities Exchange (EESE), successfully increasing competition for local listings. As one of the largest job creators in emerging markets, the SME sector needs to be actively supported and assisted to grow by listing on exchanges and raising capital for expansion, thus creating more employment. In most African exchanges the financial and consumer services sectors dominate, which underlines the need to expand the listing base to other industries, especially to the energy and infrastructure sectors. Smaller exchanges, which are finding it difficult to attract listings, might wish to consider merging with other exchanges to form a regional exchange with increased market capitalisation and potential to attract IPOs. In conclusion, African exchanges have tremendous value to offer investors, companies wanting to list and the IT and financial services sectors. However, there are a few issues that still need to be sorted out by African governments and exchanges to make their exchanges more attractive and accessible. Once these issues have been addressed, Africa would no longer need any aid but would instead be able to thrive on investments and start building a better continent for all. President Akinwumi Adesina of the AfDB rightly remarked that Africa needs investment, not aid, and this is the way to bring about an investment revolution on the continent. Governments, along with regional and continental organisations, need to review and adapt current legislation to make it easier for non-residents to invest in their exchanges. Continental legislation needs to be adopted to encourage intra-Africa investment in African exchanges. African exchanges require further digitisation and should be placed on major trading platforms to encourage global investment. The lack of liquidity in African exchanges can be overcome by encouraging corporate investment and educating the growing middle and upper classes on the benefits of investing in exchanges. Local and foreign companies need to be educated on the benefits of listing and should be actively encouraged and assisted in doing so, especially SMEs. ‘Africa’s top performing stock exchanges by Sunita Menon’, Business Live, 22 June 2018. ‘Continent’s free trade deal a game-changer for Africa’, IOL, 3 July 2018. 2017 Africa Capital Market Watch. PWC. March 2018.